Wednesday was hammer central as the men’s and women’s hammer competition took place at Hayward Field. For Rudy Winkler (Cornell ’18) it was some night indeed. Winkler was in flight two with former Princeton athlete Conor McCullough. Both men finished among the top 9 throwers at the end of three throws, giving them the chance to compete in the finals (McCullough was 2nd with 243-04, Winkler was 6th with 237-06). But in these finals was when Winkler released that wired ball and set a new all-time Heps record – 251-10 (76.76m) – to move into the leader position and dropping McCullough to third overall. The distance is almost 5 feet better than the conference record (NOTE: because the Olympic Trials is outside of the regular NCAA season, we do not consider the mark a conference record but an all-time record). In the end, Winkler earned the national title, while Kibwe Johnson was second (246-05) and McCullough was third. However, none of these men have the Olympic standard of 77m (252-07 1/2). When we asked Jesse Squire – a self-proclaimed “tracksuperfan” who was live tweeting the hammer competition from the facility – about what would happen in this situation, he responded by saying that the Olympic standard set by IAAF was “too tough” and that the Olympic committee will need to send out invitations to fill out the 32 person field. In Squire’s opinion, the top 3 Americans in the world rankings would likely get invites later in July. According to road-to-rio.com, Johnson is the top ranked American in 23rd while McCullough is ranked 25th. Winkler’s distance would have him ranked 28th, but as the fourth American on the list behind A.J. Kruger (26th). This list will continue to be updated until the end of the Olympic qualification window on Monday July 11th, so we will have to wait and see who will get one of those golden tickets. “Rudy became the first collegiate athlete (and he has two more seasons of eligibility left!) to win the US Olympic Trials in the hammer since 1956… and who was the last to do that 60 years ago?! None other than Cornell Hall of Famer Al Hall ’56!!! Further, Rudy’s throw of 251-10 is also now in the all-time top 10 for collegiate athletes. 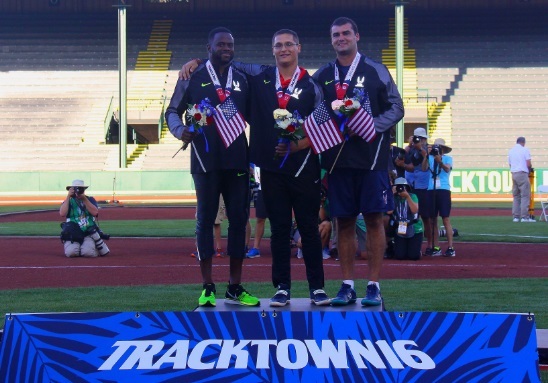 In speaking with Olympic staff and other USATF officials after the meet, Rudy’s status as a member of the United States Olympic team for Rio will be decided by July 15 when the IOC fills the field in his event based on the international descending order list. He’ll go through US Team processing tomorrow and hope that the international selection process over the next few days will work out in his favor. We also received word that Winkler has reportedly thrown 77.78m in a small meet in June which surpasses the Olympic standard, but the mark has not been ratified by USATF or the international community for some unknown reason. Hopefully that mark is accepted as it will guarantee Winkler a spot on Team USA. This entry was posted on Wednesday, July 6th, 2016 at 9:34 pm. It is filed under Olympics, Spotlight. You can follow any responses to this entry through the RSS 2.0 feed.